Winter rye (Secale cereale) can be used as a cover crop after corn silage to protect against soil erosion, and in parts of Wisconsin is recommended by conservation planners. Properly managed, it has multiple uses and benefits beyond conservation, including forage production, nutrient management and weed suppression. It can also provide a hedge against weather related forage shortage caused by alfalfa winterkill or drought. 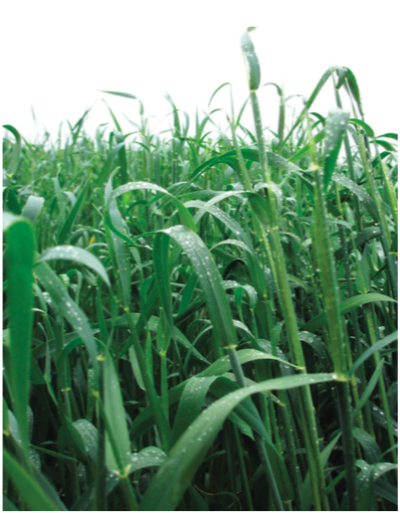 This publication focuses on using rye as an early-season forage crop. However, when rye is managed for optimum forage production, conservation and nutrient management benefits will also be achieved. Except where otherwise noted, the information presented is based on trials conducted at research stations at Arlington, Lancaster and Janesville, WI from 2004 to 2006. Rye, planted in the fall, can produce substantial dry matter (DM) yield the following spring, often without undue planting delay for the following crop. 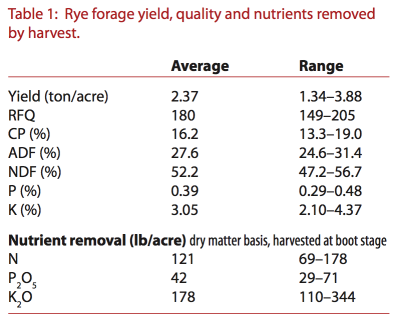 Rye harvested at boot stage typically produces DM yield in the 2 to 3 ton per acre range at quality levels acceptable for many animal production groups (Table 1). Planting: Rye should be planted as soon after corn silage harvest as possible. 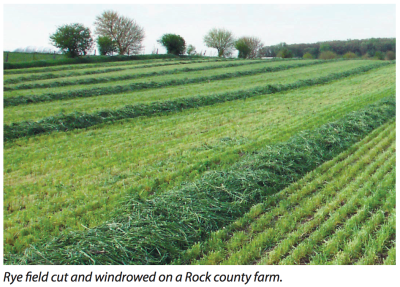 In southern Wisconsin, rye planted in mid-to-late September produces higher forage yield, and tends to mature slightly earlier the next spring. 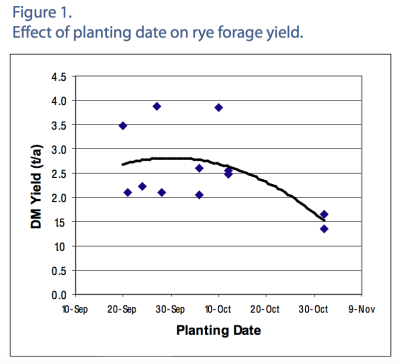 However, yield potential does not significantly decline until about October 10th (Figure 1). 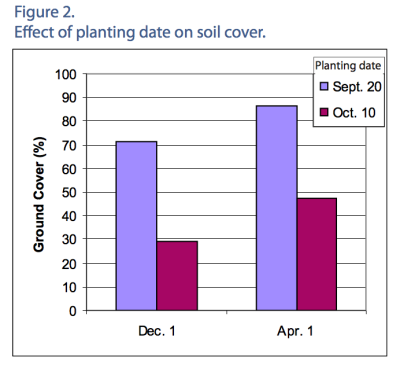 Later planting results in less soil cover going into winter, thus reducing soil protection (Figure 2). However, rye grows rapidly in spring and acceptable forage yield can usually be achieved with later October planting. Seeding rates of 90 to 112 lb per acre are needed for maximizing forage yield when rye is planted in a timely fashion. Published recommendations of 60 to 90 pounds are based on re intended for grain production and will probably result in lower forage yields and insufficient soil cover. Seeding rates beyond 112 lb per acre (2 bushel) may increase yield when rye is planted later than October 10th and will help to increase over-winter soil cover. Harvest: Rye is harvested in boot stage to balance yield and quality, similar to oats. Boot stage is just before seed head emergence when the head can be felt near the top of the leaf whorl within the sheath of the flag leaf. Earlier harvest results in high quality but low tonnage and later harvest results in lower quality. 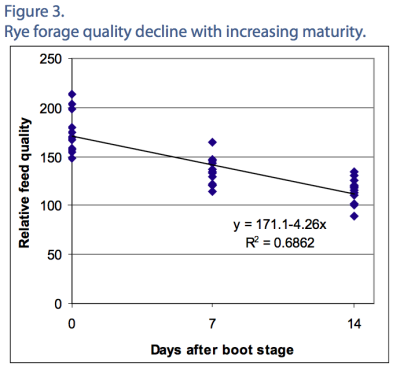 Forage quality declines rapidly with increasing maturity beyond boot stage, 4 to 5 relative forage quality (RFQ) points per day, making timely harvest critical (Figure 3). Also, boot stage is short, lasting only a few days. To optimize both yield and quality, rye should be harvested on the earlier side of this stage, well before the flag leaf splits and heads begin to show. Boot stage typically occurs by mid-May in southern Wisconsin, but can vary, depending mostly on growing conditions. This can complicate planning, especially if harvest involves custom operators and may delay planting of the summer crop. This is also a period with high probability for rainfall in Wisconsin, potentially creating a problem with rapid quality decline if harvest is delayed. Practical experience suggests rye should be harvested early if long-term forecast predicts a wet period in the future. Fertility: Rye responds to added nitrogen (N) with increased yield and crude protein. Under Wisconsin conditions, the economically optimal N rate to apply is 40 to 60 lb per acre when using commercial fertilizer. If all of the N will come from manure and/or previous legumes, the economic optimum may be closer to 80 lb of creditable N per acre. The higher rate from these organic sources will also help account for variability in manure application and mineralization of organic N. Nitrogen applications may be reduced if the pre-plant soil nitrate test (PPNT) suggests that elevated levels of residual N exist in the soil. Nitrogen should be applied in early spring before rapid growth begins. Nitrogen rates beyond 80 lb per acre reduce yield for a variety of reasons including lodging. Additional N is not needed if used only as a cover crop, and may result in excessive residue which may be difficult to manage. Soil phosphorous (P) and potassium (K) should be sufficient on most farms that no additional nutrients are needed to support rye growth. Rye harvested and used as forage has some storage and animal health considerations. Practical experience suggests rye forage can put excessive pressure on silage bags causing failure. The University of Arkansas recommend bags not be overfilled, and closely monitored for tearing, especially along the top of the bag. Reducing packing pressure may reduce the risk of bag failure. Bags should be monitored frequently and tears repaired immediately. Rye forage can contain high levels of K which may limit its feeding flexibility in dairy rations. Data from the National Research Council (NRC) shows average K levels of 3.34%, greater than most forages including alfalfa. This increases concern about hypocalcemia (milk fever), especially given that its nutritional value is more suited to dry cow rations than lactation diets if harvested on the late side. Care should also be taken because rye is a luxury feeder of K. Many farms have elevated soil test K levels which could lead to excessive K uptake. Wisconsin data has shown forage levels as high as 4.37% when rye was grown on soils exceeding 300 ppm K . Rye forage should be tested so K levels are known and rations adjusted accordingly. Rye can be an important component in whole-farm nutrient management planning and nutrient cycling. It grows actively, taking up nutrients during the late fall and early spring when significant infiltration and leaching occur. Harvest of rye forage, followed by a subsequent crop significantly increases annual nutrient removal from soil. Nutrient management planning benefits include both N and P, or just N, depending on whether rye is harvested. Rye’s ability to reduce the amount of soil nitrate that remains from the previous crop is well documented in eastern and southeastern states where milder winters increase the likelihood of over-winter leaching losses. 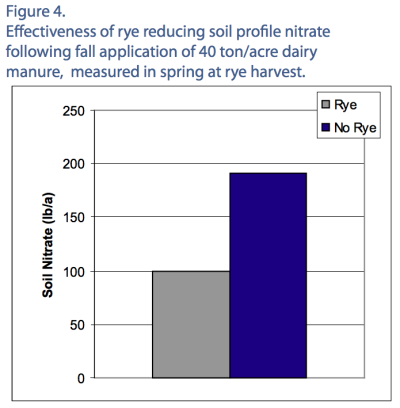 Even in Wisconsin, where frozen soil prevents leaching for much of the winter, rye can significantly reduce soil nitrate following fall manure application (Figure 4). This benefit occurs even if rye is not harvested and will help protect groundwater quality where heavy manure applications have been made. Removal of rye forage in spring can also remove significant amounts of P and K (Table 2). Coupled with nutrient removal from the summer crop, annual nutrient removal is significantly increased, which can greatly benefit nutrient management planning. 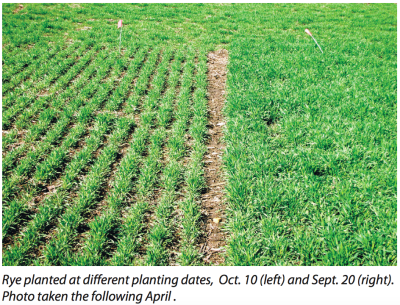 Rye could be used to help draw down soil test P in fields with excessive levels where nutrient applications may otherwise be prohibited under P based planning and regulations. Rye could also be used to maintain current soil test levels under higher rates of nutrient application (i.e. maintain higher application rates by matching application with removal). Although further research is needed, a nutrient management planner can assist in estimating a field’s nutrient budget when including rye as forage. All corn herbicides have a rotation interval before rye can be planted. Rye may be listed specifically, or grouped with “other crops”. Many herbicides list rye specifically and require a four month or greater interval from herbicide application to rye planting. Care should be exercised choosing herbicides when planning to follow silage with rye to prevent herbicide related problems. Seed source and variety: Seed suppliers may not commonly stock winter rye seed so availability should be checked in advance. Certified seed of varieties “Hancock” and “Spooner” are available in Wisconsin, along with uncertified common seed. All have performed similarly in Wisconsin trials. Depth: Rye should be planted 1 to 1.5” deep, regardless of tillage system. Good soil-seed contact will aid germination and hasten the development of soil cover. Rye is well suited to no-till establishment. Planned manure applications following corn silage harvest can be an obstacle to timely rye planting, especially for a daily haul situation. A possible option is to apply manure after the rye is planted and has emerged as a way of avoiding a planting delay. However, this is likely a good choice only if the manure is very liquid (< 10% solids) and if rates are kept at 5,000–7,000 gallons per acre or less. Side-by-side demonstrations have indicated slight yield reductions where semi-solid manure was applied to early-growing rye because seedlings were smothered by bedding or feed refuse in the manure. Variations in weather and maturity may make harvest of forage with satisfactory quality challenging in some years. Should delays prevent harvest at boot stage, termination with herbicide should be considered. Conservation and nitrogen scavenging benefits will already have been realized, weed suppression potential improved, and an inventory of lower quality forage prevented. Use glyphosate or paraquat at standard burndown rates. Be sure to adjust boom height to insure adequate coverage of the canopy, especially with taller rye. Planting corn, soybeans or alfalfa are all options following rye forage harvest. Immediate no-till planting of glyphosate resistant corn or soybeans into the rye stubble can be followed by later glyphosate applications to control rye regrowth as well as other weeds. In most cases, a single application is adequate. No-till crops should be closely monitored for insect infestation. With tillage-based planting, fairly aggressive tillage, followed by a post-emerge weed management plan is likely required for adequate rye control unless the rye was harvested later than boot stage. Trials conducted at the Arlington Research Station (ARS) suggest soybeans or alfalfa may be the better options than corn following rye. Overall, corn showed yield reductions when planted with or after rye, wile soybean yields were similar across the rye cover crop, forage and no rye scenarios (Tables 3 and 4). 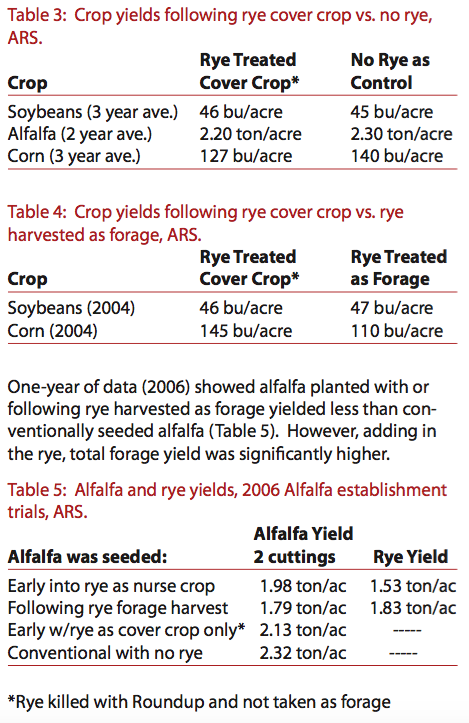 One-year of data (2006) showed alfalfa planted with or following rye harvested as forage yielded less than conventionally seeded alfalfa (Table 5). However, adding in the rye, total forage yield was significantly higher. **Note that rye may inhibit establishment of alfalfa. College of Agricultural and Life Sciences, UW-Madison. University of Wisconsin-Extension is an EEO/Affirmative Action employer and provides equal opportunities in employment and programming, including Title IX and ADA requirements.